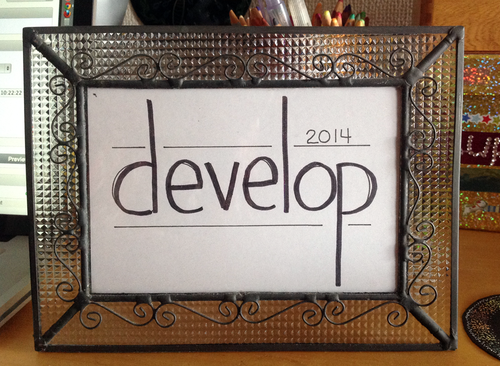 Develop is my guide word for 2014. I am excited about this one. It sings of continuation, growth, progress, and new ideas but without demanding perfection. I might develop an act, develop my skills, develop photos, develop the community, develop some software, develop a passion, develop a plan. I also like it because the longer I look at it written down, the funnier it seems. It's pointy in the middle and loppy at the end. A bit devilish. And it even sounds good backwards: poleved.